Birds in the above photo include Pink-eared Ducks, Red-necked Avocets and Banded Stilts. The warm summer weather was perfect for people and the birds were plentiful and much-photographed. We entered at the Beach Road gate and gradually worked our way towards the bird hide by lunch time, stopping variously along the way. In the afternoon we partly retraced our steps then drove to the T-Section and Western Lagoons. Special sightings during the day included good views of White-winged Black Terns and Pectoral Sandpipers. From time to time small birds, such as Golden-headed Cisticolas and Brown Thornbills showed themselves. A total of 26 people recorded 85 bird species for the day. 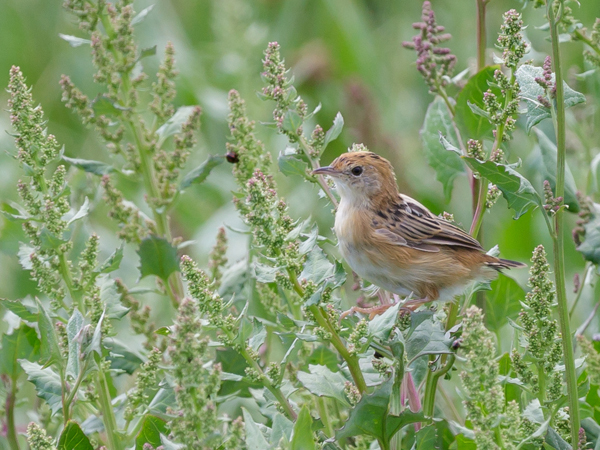 Above: a Golden-headed Cisticola popped up for a minute or two. 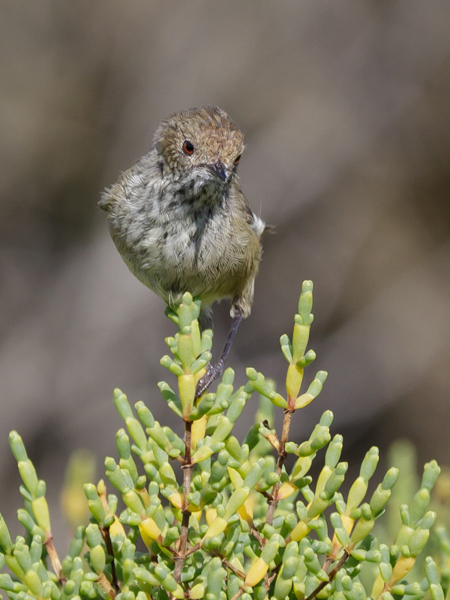 Right: a Brown Thornbill appeared where moments earlier Cisticolas had been seen. It was almost winter, and certainly felt like it with grey skies, some rain and a biting wind, which was too lazy to go around, but happy to go right through (as more than one person commented). Every now and then the sun shone with welcome warmth. Mostly we were too busy watching all the birds to worry too much about the weather. Numerous water birds were about as well as raptors and little birds that inhabit shrubs and grassland. We recorded more than 70 species in all. A highlight was the Northern Shoveller that has been attracting much attention from twitchers recently. When we saw it, it was a long way across the water and appeared as little more than a white dot in my photos, so I have not included them here. Fortunately we had much closer views of most of the other species we recorded. Phragmites, a road and a line of cloud. 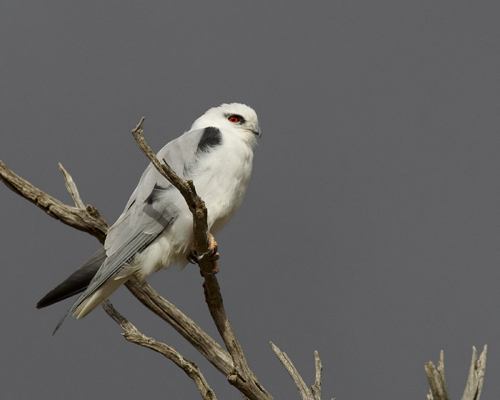 A Black-shouldered Kite perched close to a road with a dark and ominous sky behind it. 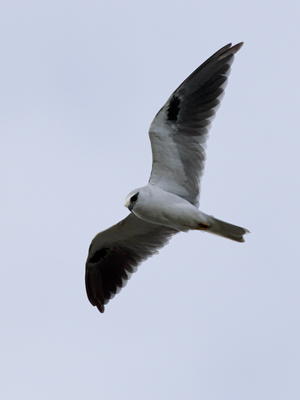 Another Black-shouldered Kite under a lighter sky. Soon after the bird flew over, it hovered not far away, then dived to the ground where it disappeared from sight for a minute or two. When it reappeared, it flew off. There was no sign of a prey item so either it had been eaten or it escaped. 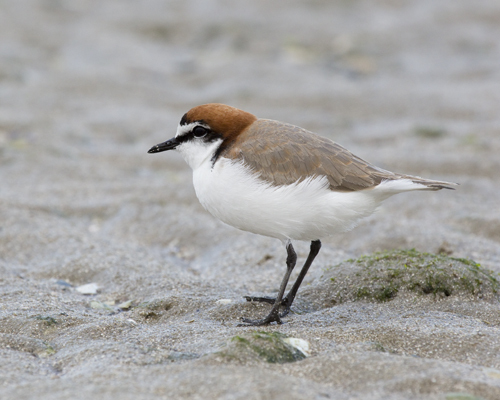 A male Red-capped Plover on the shore. 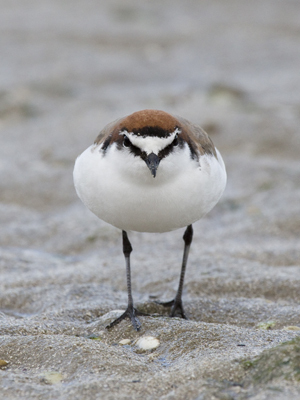 The bird eventually allowed us to approach close enough to photograph it and it came even nearer to us when a flock of Red-necked Stints landed beside it. Earlier, other observers saw it eat a very large worm. It stayed still for so long afterwards that we assumed it was too full to move. Red-necked Stints, constantly feeding by the shore. ... and one of Silver Gulls.